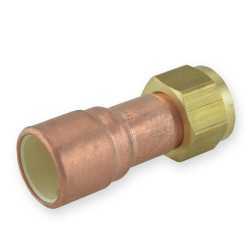 Connect PVC and CPVC tubing to threaded pipes and fittings with Canarsee's distinctive selection of PVC & CPVC Adapters. Sort through different sizes, configurations and connection types and find just what you need for your residential plumbing system. The 646-CG2 from Sioux Chief is a 1/2” MIP x 1/2” CPVC Adapter, Lead Free. This adapter is used to c.. The 646-CG3 from Sioux Chief is a 3/4” MIP x 3/4” CPVC Adapter, Lead Free. This adapter is used to c.. The 646-PG3 from Sioux Chief is a 3/4” MIP x 3/4” PVC Adapter, Lead Free. This adapter is used to co.. The 633-C02 from Sioux Chief is a 3/4” FIP Swivel x 3/4” CPVC Adapter, Lead Free. This adapter is us.. The 646-PG4 from Sioux Chief is a 1” MIP x 1” PVC Adapter, Lead Free. This adapter is used to connec..